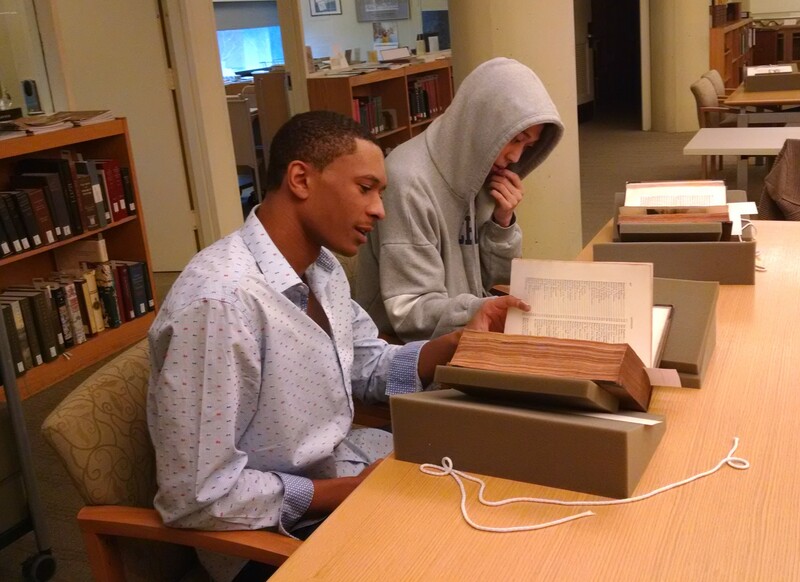 The Watkinson has a great variety of historical books, records, photos, prints and more. While working in the Watkinson, I have been introduced to the many ways history is recorded. Most recently I organized a collection of British caricatures. The collection contains around 190 prints with ranging topics, but a majority are political and social satire. The popularity of these prints and the impact they had on British society made me want to research more about the evolution of printmaking and why these prints were so important. The reign of King George III from 1760 to 1820 marked a time of ideological revolution and the rise in satirical prints. The mass production of prints allowed for information to be accessed by the ordinary person, who was most likely illiterate. 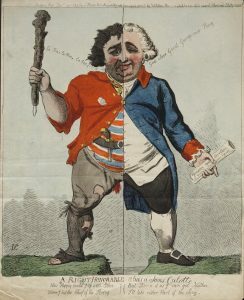 British satirical caricatures were used to criticize certain political decisions or platforms of political parties in particular the Whig and Tory parties. Prints created in the 18th century use the technique of physiognomy, which is the judging of a person’s character from the depiction of their physical features. These prints have grotesque and distorted images of various politicians, but mainly Charles James Fox (Whig Party), William Pitt the Younger (Tory Party), King George III and Napoleon. 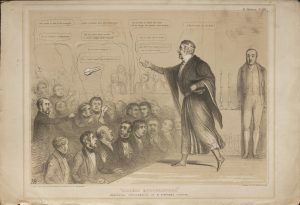 A famous printmaker, Isaac Cruikshank, depicts Charles James Fox as a French Revolution sympathizer in his print “A Right Honorable Alias Sans Culotte” which is one of the prints in the collection at the Watkinson. This print contains Fox split into two different outfits. 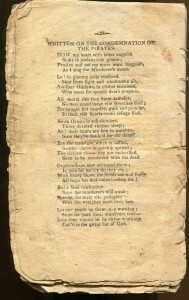 As the spectator of the print, on the right side, Fox is dressed neatly in English clothing singing “God Save Great George our king.” On the left side, Fox is dressed as a French revolutionary in ragged, torn clothes with a bludgeon singing, “Ca ira, ca ira, ca ira,” an emblematic song of the French Revolution. Images such as these were used to ridicule politicians. Some victims of the political satires, like Fox, would buy entire editions or even bribe publishers to stop printing these satirical images in order to maintain a positive public image. As printing and satire evolved, there was a shift in technique. Around 1820 the grotesque satirical style was phased out and a newer more genteel trend became popular. John Doyle, a famous printmaker who published his work under the initials HB, was known for his mild satire with more naturalistic depictions of political figures. The collection in the Watkinson contains thirty of John Doyle’s prints. Grotesque satirical prints were replaced with comic prints that were made more for family consumption. With the popularization of newspapers and magazines the number of singly published sheets rapidly declined. In the Watkinson, the prints are mostly from the 1800s. Some of the early prints show the characteristic grotesque form of satire, but most of the prints are more realistic in their depiction of politicians. While processing these prints, I learned a lot about the political scene in Britain at the time. As time passed the literacy rates in Britain rose, which is evident from the later prints in the collection at the Watkinson. Earlier prints do not have much text other than the titles, but speech bubbles and small captions can be seen in the later prints. 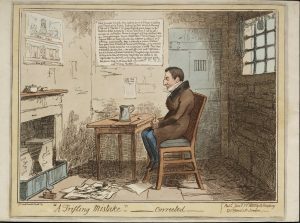 This shows just how influential the mass production of prints was and how the prints reflect British society in the time period during which they were published. Just like the Currier and Ives prints that I worked on in January, these prints are both historical in content and historical in creation. Prints are a great way of interpreting history since there is much more behind them than what is seen on the page. The British print collection at the Watkinson is definitely a reason to stop by! Bury, Stephen J., and Andrew W. Mellon. “British Visual Satire, 18th–20th Centuries.” Oxford Art Online, http://www.oxfordartonline.com/page/british-visual-satire-18th-20th-centuries. Accessed 25 Apr. 2018. Donald, Diana. The Age of Caricature: Satirical Prints in the Reign of George III. Published for the Paul Mellon Centre for Studies in British Art by Yale University Press, 1996. George, Mary Dorothy. Catalogue of Political and Personal Satires. The Trustees of the British Museum, 1978. 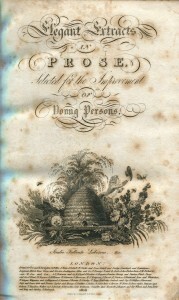 Elegant Extracts in Prose: Selected for the Improvement of Young Persons, published in London and printed for F.C. and J. Rivington [etc.] 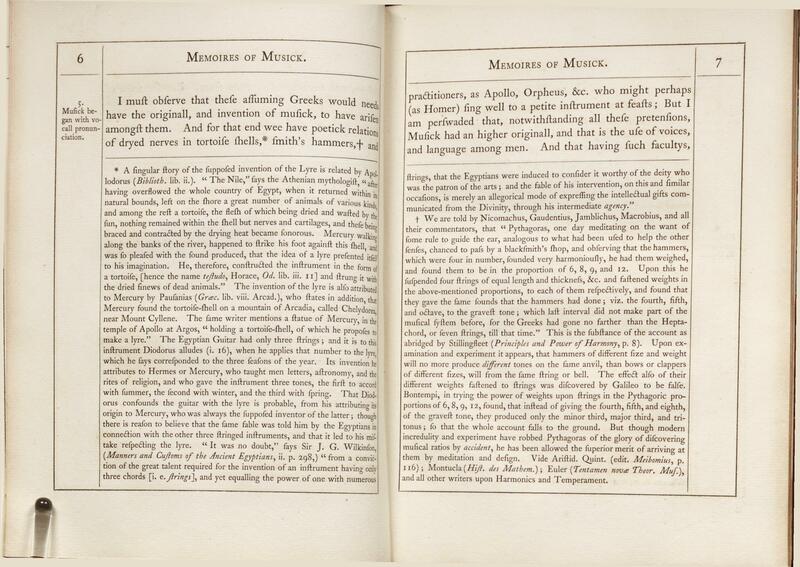 by G. Woodfall & H. Bryer was edited by Vicesimus Knox and published in the tenth edition 1816 (originally in 1783). 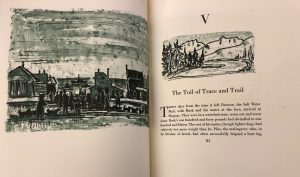 The publication—composed of four sections, called “books”—is compiled in two separately bound books (anthologies): Prose I and Prose II. Each of the two prose books contains two parts—in Prose I) Book I, Moral and Religious; Book, II Classical and Historical and in Prose II) Book III, Orations, Characters, and Letters; Book IV Narratives, Dialogues. 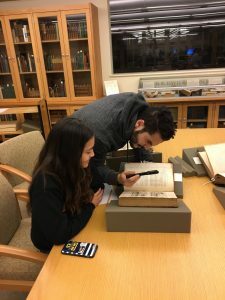 The books belong to a three-part educational anthology series, which gives a sense of the different kinds of late 18th and early 19th century English texts. As evident in the titles of each of the four books, several different types of texts are exhibited in the series, all with some sort of educational service to “young persons,” or students. The books are in moderate physical condition. 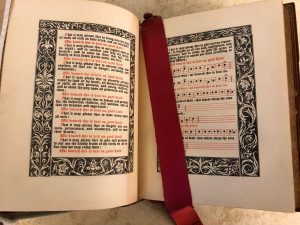 They are bound very typically for books of that era—in basic brown leather with hard front and back covers adorned by decorative engravings and gold detailing along the borders. 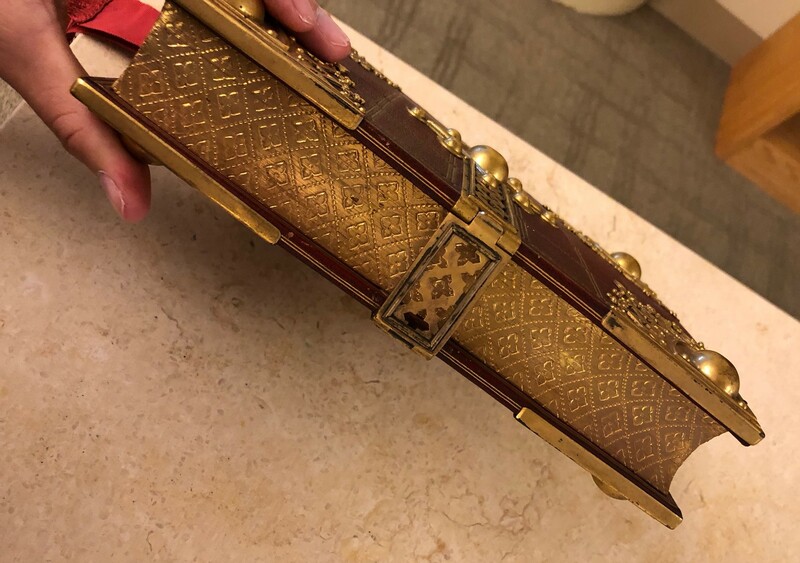 The books are clearly used, with the front and back covers of each either loose or detached completely (but still kept with the pages) from the leather spine. Each book is about an inch to an inch and a half in width, measuring slightly under 8×10 inches across the covers. According to these conditions, it appears as though the books were frequently used. The hard cover binding suggests a sense of quality of text, yet neither the finest nor the most ornate bindings were used. This type of binding seems to propose the notion that this anthology was a part of a respectable series, used by school students in this era. Vicesimus Knox, a headmaster and writer, was a renowned member of a long line of family invested in education. He was a well-educated and religious man, who led a highly accomplished existence. He took over the position of Headmaster at Tonbridge School in Kent (an preparatory school in England for boys) only one year upon graduation from St. Johns College in Oxford, at age twenty-six. The young, zealous, and highly educated young man drew a large increase in admissions. This increase was also partly to do with his writing. Within the first few years of being headmaster, he gained much notoriety from his publications Essays Moral and Literary, published in 1778, and Liberal Education, or, A Practical Treatise on the Method of Acquiring Useful and Polite Learning, published only a few years later, in 1781. He was clearly very passionate about the education of young pupils, which is comprehended through this publication and even further reiterated in several others to follow. Then, finally, late in his career (shortly after retiring as Headmaster, but still displaying an unyielding fervor for educating the youth), he published Elegant Extracts in Prose: Selected for the Improvement of Young Persons. 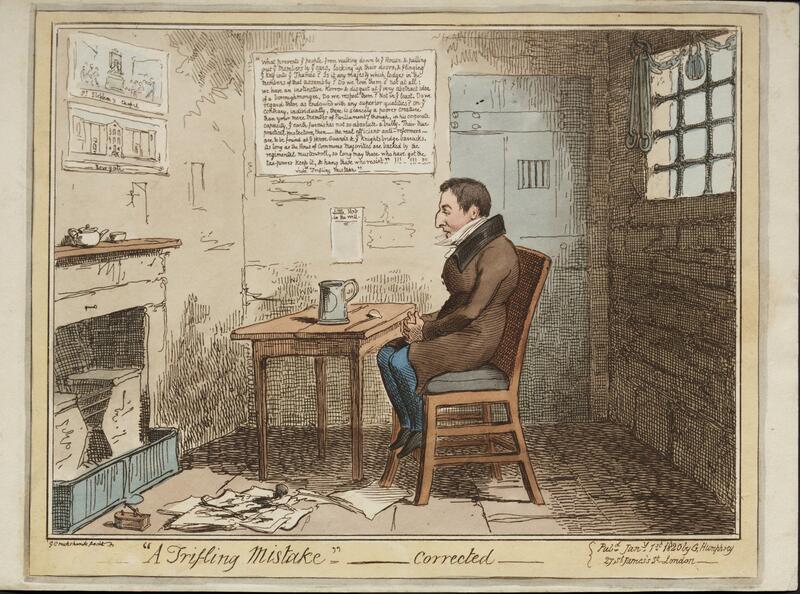 The publication focused on his profound knowledge of English literature. According to the Oxford Dictionary of National Biography, his aim was to compile an anthology of English literature (found important, moral, educational, virtuous, and worth-while by him) that would serve to “[improve] …youthful and middling readership.” He focused more on modern literature (of the time) and less on classical. 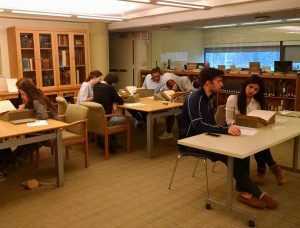 The anthology also showcased several non-fiction essays (mainly selected from Addison, Johnson, Richard Steele, and Hugh Flair) in additional to modern fictional pieces of literature. 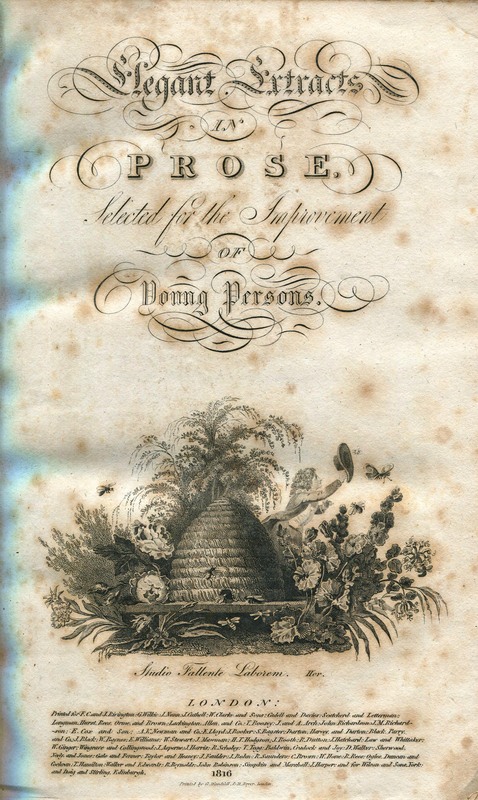 What was particularly progressive about this publication was its attention to eighteenth century female writers (such as Anna Aiken, Hester Chapone, and Catherine Macaulay). He believed in and wanted to see an increase the education of girls/women. Knox has cast a lasting influence on the Tonbridge School’s library. It is said in the Oxford Dictionary of National Biography: “Knox’s own literary tastes and their influence, are clearly reflected in the coverage of the Tonbridge School library during his mastership.” A vast selection of the library’s literature was written by authors of the various prose chosen by Knox for this very anthology (and others in its series). 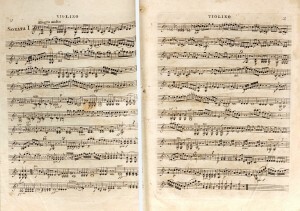 Although the anthology was first actually published in 1783, one of its later editions (of which there are several) dates to 1816. 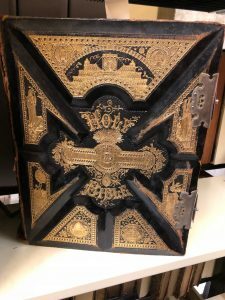 Based on both the physical condition and the knowledge behind the editor’s creation of the books as well as its lasting impact, it can safely be presumed that these books were used a great deal in English upper schools in the late 18th and early 19th century. The anthology series was costly and well known around the time of its publication; hence why they were referenced in novels such as Jane Austen’s Emma, published in 1815. Robert Martin, the character in Emma that reads from the anthology is insinuated to be a man who has money and is learned (simply because of his reading of the anthology, perhaps among other factors). 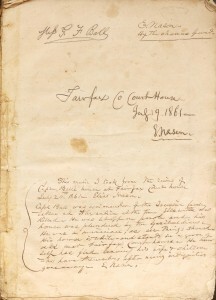 The implications provided by novels such as Emma, which reference the anthology, attest to its esteemed reputation and stature. The anthology, as illustrated by the four books of which it is composed, offers English texts which emphasize religion, classical literature, historical literature, public speaking, use of characters, letters, narrative, and dialogue between characters. These topics were and are still, today, the foundations of English literature. 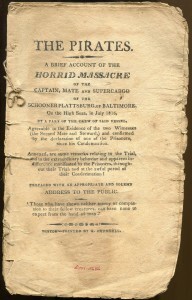 A “Horrid Massacre” by Pirates! The Pirates. 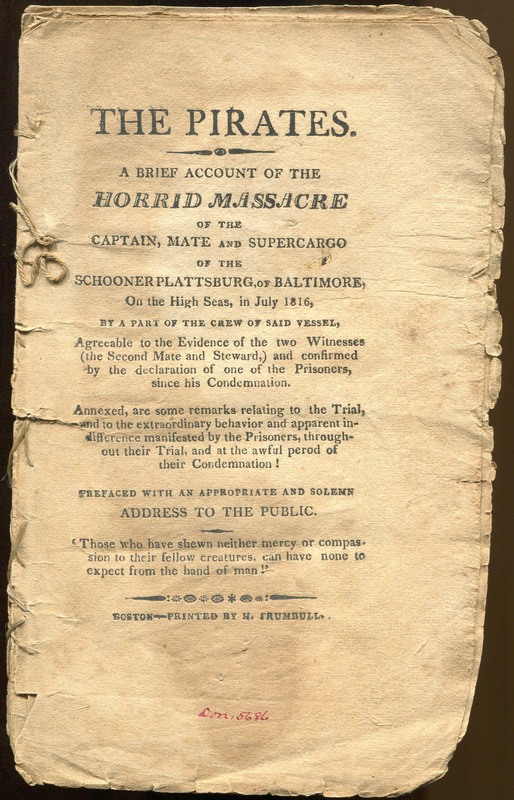 A Brief Account of the HORRID MASSACRE of the Captain, Mate, and Supercargo of the Schooner Plattsburg of Baltimore was printed in Boston by H. Trumbull. 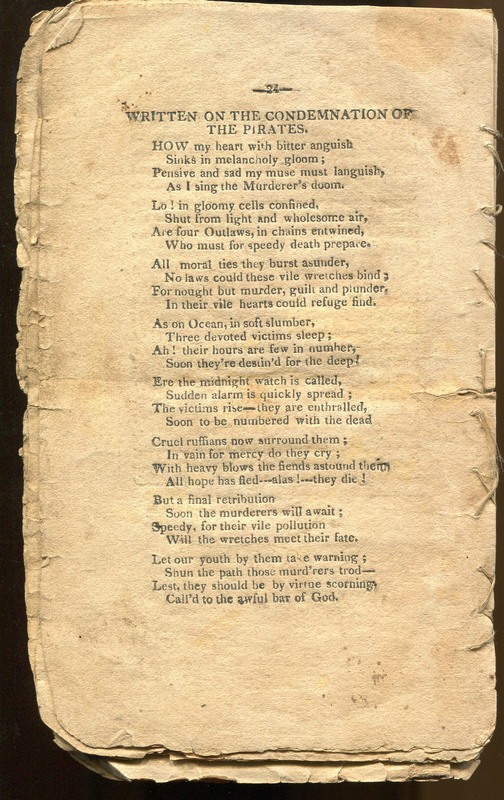 The author and publisher are not specified but it is clear that the purpose of the text is as an address to the public to inform them of the “Horrid Massacre on the High Seas.” The date of publication is also not specified although the account in which the text addresses took place in July of 1816 as several dates are referenced throughout the story-like description of the account. The writer goes into detail on the mutinous actions of the crew of a ship led by a man known as John Williams. In short, the vessel departs from Baltimore early in July of 1816 with a cargo of nearly $42,000. The crew of only fourteen men, led by John Williams, successfully takes over the vessel by beating the captain and first mate and then proceeding to toss them overboard the ship. They also brutally beat Baynard (the supercargo) to death on the deck of the ship and after seriously injuring the second mate with an ax, John Williams elects to spare his life. This proves to be a costly mistake when Onion (the second mate) turns the mutineers over to authorities after arriving in Copenhagen. The proceeding trial and decision of execution caught the attention of many as the courtroom was filled to capacity during every day of the trial as well as thousands being present at the hangings. The mutineers were found guilty of murder and piracy. 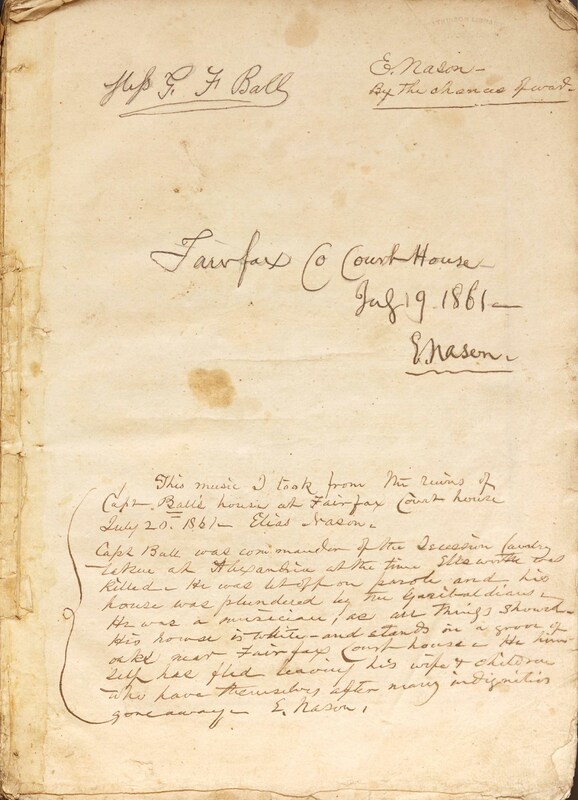 The popularity of the trial no doubt led to the inspiration and decision to make a specific detailed account of the events of the mutiny in the very book I am reporting on. The book itself is clearly very fragile and I used extreme caution when handling it. 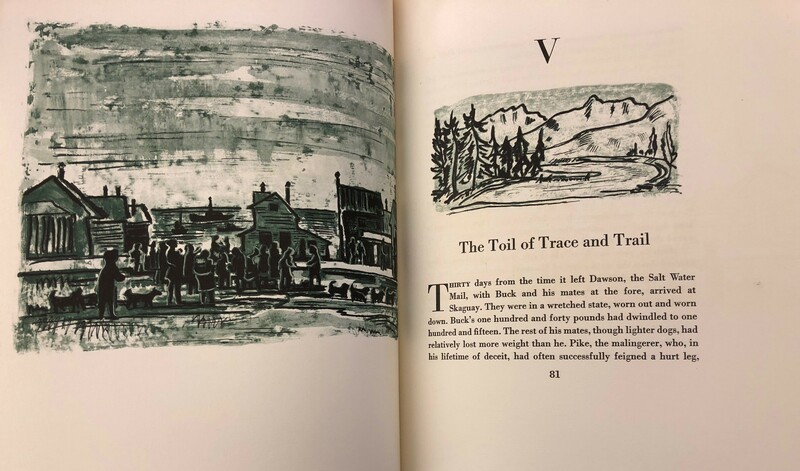 There are stains of different kinds of every page of the text as well as dozens of smudged and/or faded words that were particularly difficult to read and required some deciphering of sorts. I decided to choose this specific book because of its title and subject matter. I have personally always loved pirate stories and adventures and to read about an event that actually took place was very interesting for me, and even more so that I got to read about the account from an original text. I was also surprised to find this type of text as its own independent book. 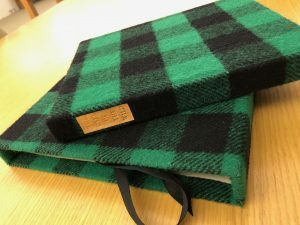 It seems like something that would likely be found as a newspaper story and not something that received its own book and binding. It would be interesting to find out how often these types of pieces, going into great detail on specific stories, were published and printed. It could be compared to a sort of modern day TV special on a contemporary topic. Such as a news station going into greater detail on an injured soldier returning home after war or a child rising from poverty to prosperity. While the book I selected is clearly meant to inform the public it is clear that it also has an entertainment value that motivated the story to have its own independent text. I guess this could be considered a modern day news special for 1816. Comments Off on A “Horrid Massacre” by Pirates! 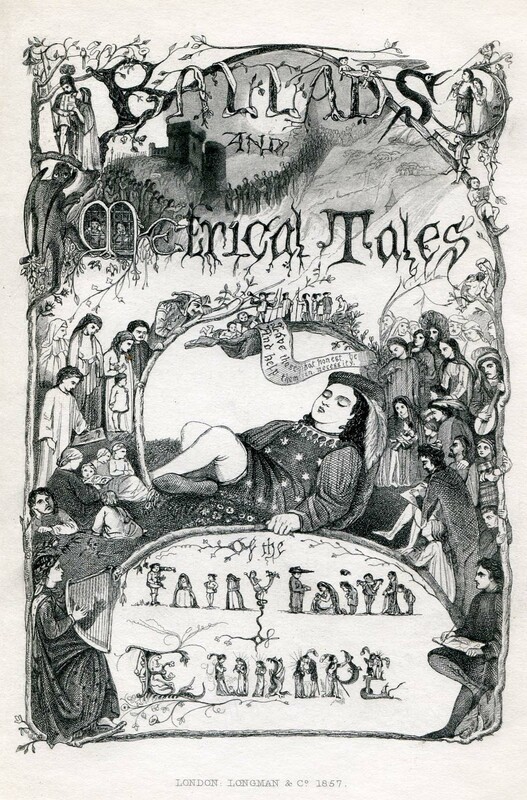 The Fairy Family: a series of ballads and metrical tales illustrating the fairy mythology of Europe was written by Archibald Maclaren and published by Longman, Brown, Green, Longmans, and Roberts in 1857. It is a collection of poetry based on the fairy folk, some of which are familiar and some of which are entirely new. It was illustrated by Sir Edward Coley Burne-Jones, who was known for being part of the Pre-Raphaelite movement. This was his first commission received and later on, he would deny any involvement, due to the amateur nature he perceived within his drawings. 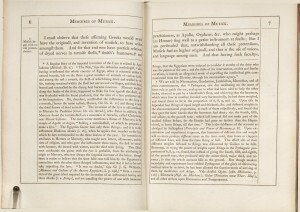 The illustrations for the book were recently displayed in the Pierpoint Morgan Library as the earliest examples of Burn-Jones’ work. The binding itself is green, with gold colored decorations, most of which are nature-themed. On the spine, there is a picture of a fairy, as well as various creatures, including a snail and bird. 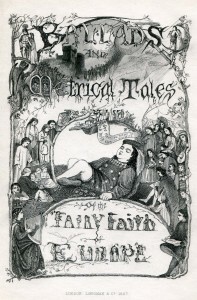 On the inside, the title page is a wonderfully complex illustration, with fairies representing the letters. Unusually for a book of its time, the introduction retains the usage of the “long s” which looks like an unfinished ‘f’ instead of an ‘s’ at times. Some of the creatures mentioned inside are common characters in children’s stories. The brownie, for example, is described as a “houfehold Spirit of the Scottifh low-lands and Borders.” Indeed, most of the creatures described here are specific to certain regions of the country. There are also plenty of others that are less commonly known, such as the Rafalki, or river nymph. Attempting to find out more proved difficult; the name does not turn up on any search engine, suggesting that this is a creature either entirely forgotten, or perhaps even made up by one of the poets in the collection. This book is particularly unusual when placed in context with other books that Maclaren wrote throughout his lifetime. Maclaren is best know as the founder of the Oxford Gymnasium and his emphasis on exercise routines in the mid-19th Century. While the Oxford Gymnasium was originally used by the British Army for their training exercises, Maclaren spread his knowledge of the benefits of physical education, going so far as to write Military System of Gymnastic Exercises (1862) and Physical Education (1895), among other similar works. So how is it that a medical man fixated on physical education came to write a book about fairies? There is little known about him that isn’t attached to his work on physical education. He was a scholarly character, not an artist. Perhaps, as his earliest work, it could be an attempt at a different career, or maybe a frivolous activity that occupied otherwise free time. Maybe we’ll never know. We can only speculate. I hoped to find an answer in the title page, but that only added a whole new dimension to the mystery with each line: Memoirs of Musick … by the … Hon. 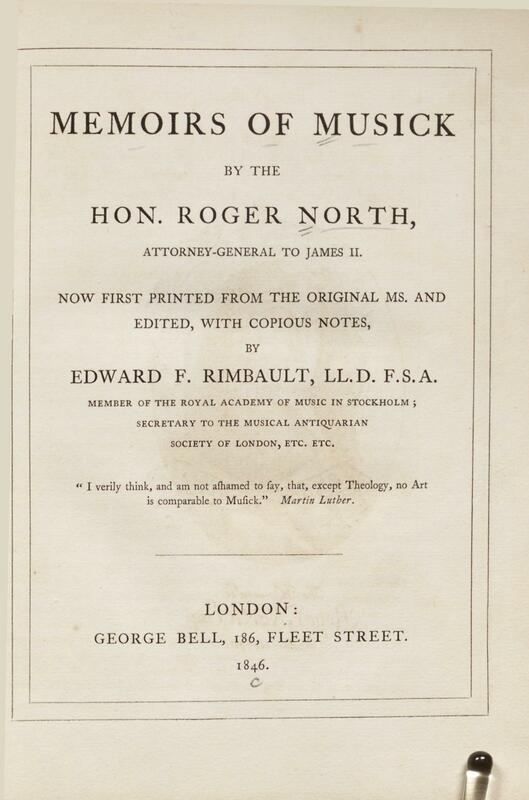 Roger North … Attorney-General to James II … Now first printed from the original MS. and edited, with copious notes … by Edward F. Rimbault, LL.D. F.S.A. … Member of the Royal Academy of Music in Stockholm; Secretary to the Musical Antiquarian Society of London, Etc. Etc. … London … 1846. Why did a former Attorney-General to James II (the one gently booted off the throne in the Glorious Revolution of 1688) write a piece on Music? 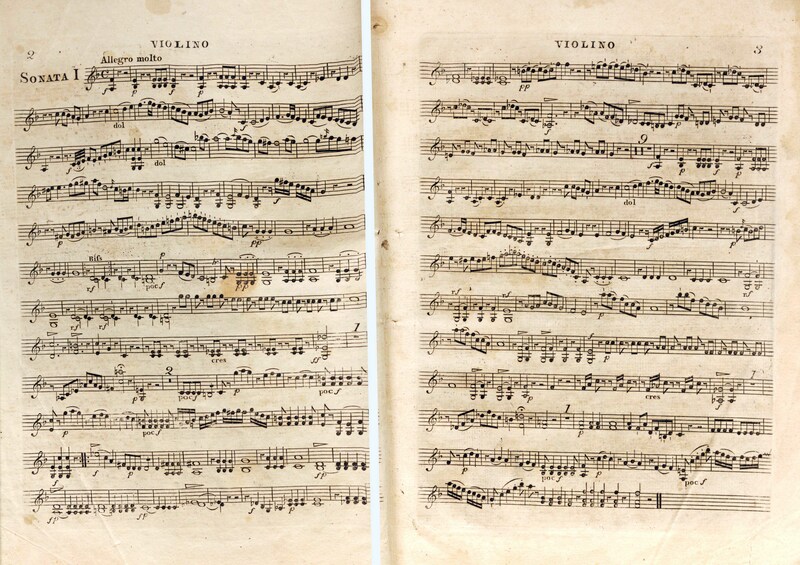 And what did a Member of the Royal Academy of Music find in it over a hundred years later that warranted the trouble of editing and printing it? Interestingly, Rimbault is also aware of his own work: “The notes which have been added are the result of much reading, and the peculiar facilities which the editor enjoys of consulting rare works. If their minuteness be sometimes uncalled for in explanation of the text, the new and curious information they convey will, it is hoped, be some excuse for the insertion. [signed] E.F.R.” The reason for this apology in advance becomes abundantly clear once you page through the text. 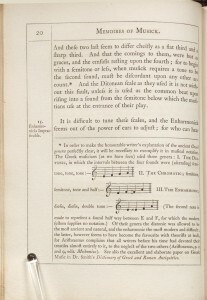 Rimbault formats each page as a grid with separated spaces for North’s text, annotative commentary, decorations, a title heading, pagination, and subject markers in the margins. The commentary is truly overwhelming at many points, to the extent that some pages contain only four or five lines of North’s text and the rest filled with Rimbault’s annotations. It seems Rimbault takes up the “Herculean” task North sought to avoid. North’s original reference to Hercules brings us to another characteristic of the work. 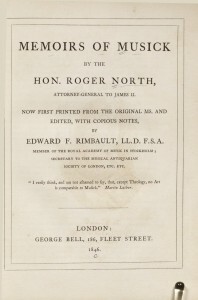 Both North’s text and Rimbault’s commentary are filled with references to the Classical world. What is most interesting is that the book goes to great length describing the music of Ancient Greece and considers Classical myth as well as scholarship as explanations for musical concepts. Discussing the origin of scales, North mentions an “Orphean Harp,” which Rimbault picks up on: “according to several traditions preserved by Greek historians, it was Orpheus who completed the second tetrachord, which extended the scale to a heptachord, or seven sounds. 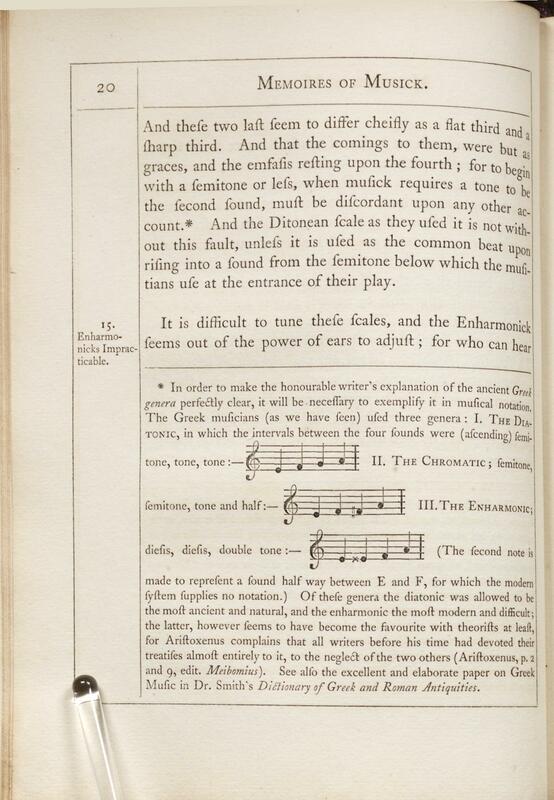 The assertion of many writers that Orpheus added two new strings to the lyre, which before had seven, clashes with the claims of Pythagoras to the invention of the octachord…” Rimbault’s dense discussion goes on for much longer, in this case and throughout the entire book. It would be fascinating to find the other half of North’s manuscript and see what he considers to be the “Science of Music.” Do the physics-based principles of harmony and sound we know today come out in North’s explanation? Rimbault’s extensive and thick commentary also brings out another color of the book. It seems that Rimbault’s printing of such a fragmentary and unknown work is more of a scholarly project than anything else. His interest is to explain and organize the work in a way suggesting that contemporary audiences would not be able to understand North’s 100+ year old original if it were not for him. 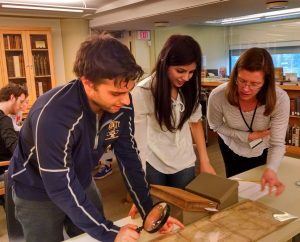 In this sense, the book also becomes an effort in historical preservation. While exploring the Watkinson for a book to examine for the course, a small, elaborately decorated leather spine caught my eye. The pattern on the spine consisted of alternating suns and moons, giving the book a gypsy-like feel. In size, the book was 5”x2 ¾”or about the size of a deck of cards. Something about the romantic decorations combined with the petit size gave the book an air of mystery and magic. I picked it up not knowing what to expect. Examining the cover, I was somewhat shocked to learn that this mystical looking book was actually an 1898 edition of Benjamin Franklin’s Poor Richard’s Almanack. The leather cover was decorated with a mix of horoscope signs and pastoral American scenes. Upon inspecting the inside, I found that it was a sort of “Best of” Poor Richard’s, with selections from editions of the Almanack ranging in year from 1733 to 1758. In the back was a facsimile re-print of Franklin’s very first 1733 Almanack. I discussed my find with Watkinson curator Rick Ring. He mentioned that the Watkinson possesses an original copy of Franklin’s 1756 almanac, and suggested I take a look at that as well. Rick brought the original almanac out and I realized that, despite the fine quality of the 1898 edition, the 1756 edition was the more exciting find. The 1756 edition has an actual connection to a living Franklin. One can imagine the industrious Franklin working diligently at his press into the late hours of the night to produce the pages I held in my hand. Of course, this fantasy neglects the likelihood that Franklin had hired drones to do the bulk of the printing work by that time of his life. 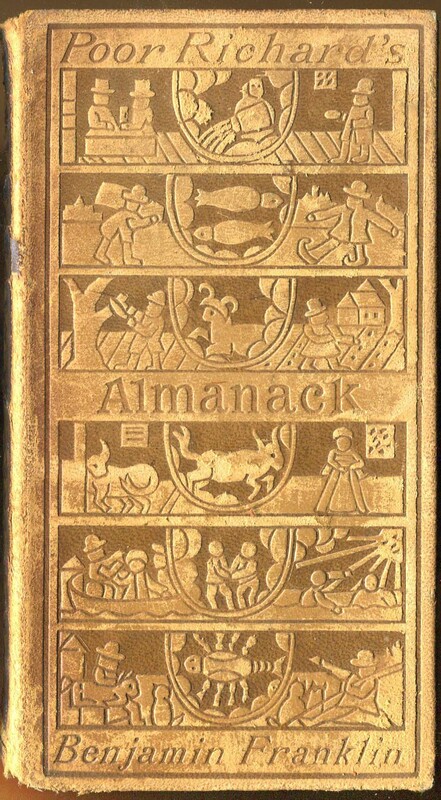 Regardless, the fact remains that Franklin lived at the time this almanac was produced, and was intimately involved in overseeing its production. 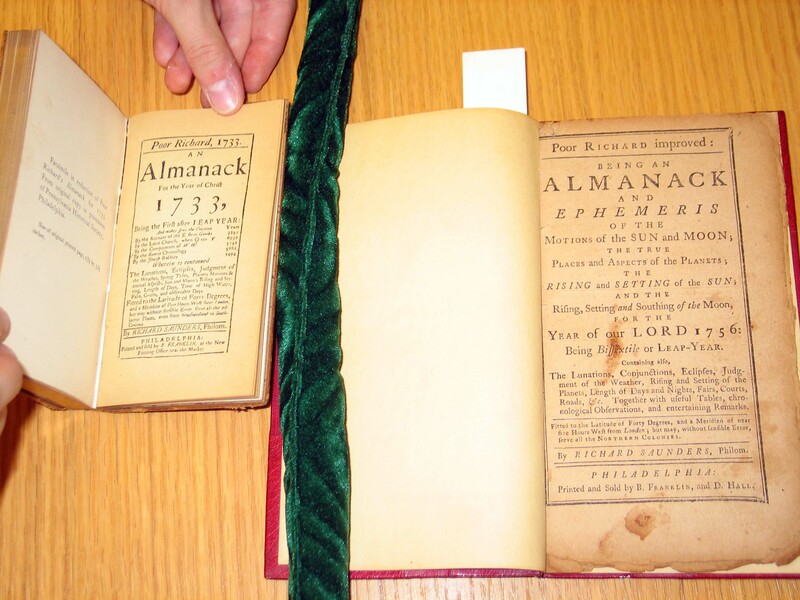 Comparing the two almanacs proved an interesting exercise. The original looked older (of course) but it also looked much more used. The 1898 version, though over a hundred years old, looked almost as if it came straight from the bookstore. 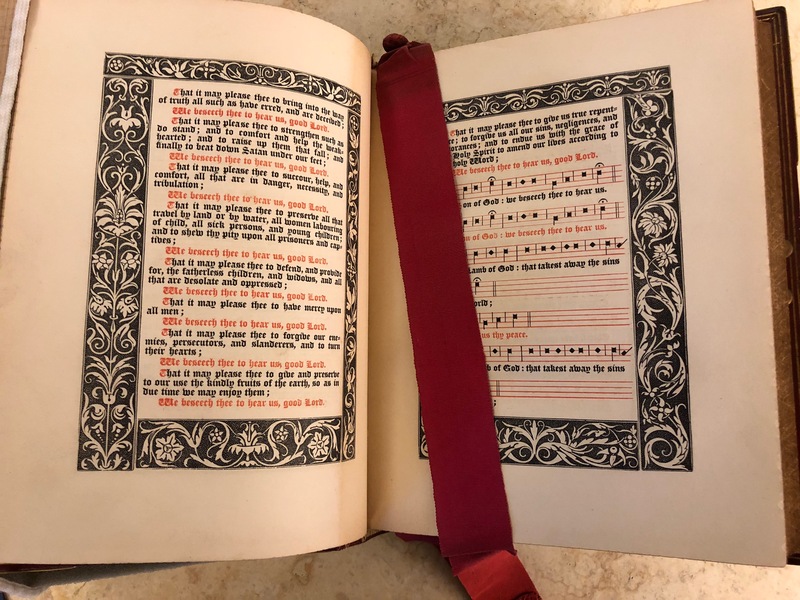 The more recent version also appears nicer; the pages are gilded and cut exactly to be exactly the same size, the paper is thick and sturdy. Comparatively, the pages in the original are thin and not all cut to the same size. No effort to achieve luxury seems to have been made with the original edition; it is quite utilitarian. Interestingly enough, though the original seems more suited to everyday use, it is substantially larger than the reprint, with dimensions of 7”x4”. The reprint seems more pocket-sized, and therefore, more convenient for everyday use. But then again, the work that has to go into making something small often indicates luxury. Take for example the ever-smaller cell phones and ipods of today. One question that came to mind about the re-print was a simple: Why? What about the culture of 1898 America created a market for this product? Unlike many modern reprints of books, there is no long-winded introduction explaining the cultural situation that accommodates publishing. One hint at why the almanac was put out can be found in the publisher. 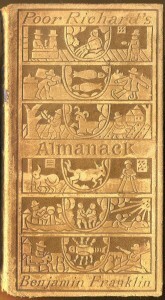 This re-printed almanac was produced by the Century Company, a New York publishing enterprise that began in 1881 and was particularly successful around the turn of the century. In 1930, the company was absorbed by another, and disappeared for a while. The company was revived in 2007 as a branch of Grand National Media. All the information I learned about the Century Company, I found on the modern Century Company’s website. In its heyday, Century Publishing was famous for its periodical, The Century Illustrated Monthly Magazine. The company showed a particular interest in producing historical works. Their most successful endeavor was an 1880s series of articles on the history of the Civil War. In 1898, the company was at the pinnacle of its success. They had the resources to put out luxury facsimiles of any books they wanted to. And what better for a company concerned with the preservation of American history than a re-print of one of the most famous publications by one of the most prominent men of early America? As I looked at the two almanacs side-by-side, I was reminded of Franklin’s efforts to create a cohesive American nation. I felt like the success of his endeavour could be seen in the two books in front of me. The luxury Century edition, printed over one hundred years after Franklin’s death in 1790 combined my reverential interest in both of the almanacs seemed a testament to the continued existence of the patriotism that Franklin worked to foster.